For training on the simulator you can use the driving range, approach shots, pitching, chipping and putting programs. 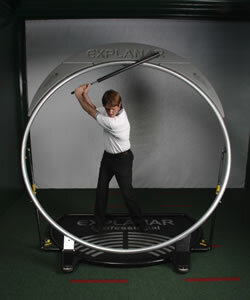 We use the professional Explanar training system. Hailed by Butch Harmon as being the best golf training aid he has seen in the last 40 years. The Explanar was designed by Luther Blacklock. It is a complete training system based around the fundamental principles of the swing plane and the biomechanics of the body. It promotes the ideal movements required for the golf swing. To find out more about our golf training please contact us via the website or call us on 0208 659 1708.